DUMBO — Seen from a distance, flock houses appear part ethereal and part industrial, like a recycled spaceship landed from outer space. In reality, these hexagon-shaped structures are appearing in public parks throughout the boroughs of New York City. And people are living inside. Envisioned by artist Mary Mattingly, The Flock House Project is a traveling set of living spaces being set up in Flushing Meadows, Battery Park, Van Cortlandt Park, Snug Harbor and DUMBO, among other city sites. Remaining in each site for at least two weeks, one to two artists make a home in the pod. Cyclists pedal to create energy for the flock house. Rainwater is captured and purified for drinking and showers. Plants for food are grown outside the house, solar power and energy created from bicycles powers laptops and other devices. The houses are almost fully self sustainable. In DUMBO, on top of the colorful paintings of Pearl Street triangle, Mattingly lives in her own flock house. She grows salad greens, eggplants, cucumbers, and strawberries. Some nights she spends alone with the Q train hurtling by above her head. Other nights, friends or other artists come to stay. Recently, though, her friend Lonny Grafman moved in. An engineering lecturer at Humboldt State University, Grafman’s class created the power-generating bike contraption. A sign posted on the outside of the flock house reads, “Have a bike? 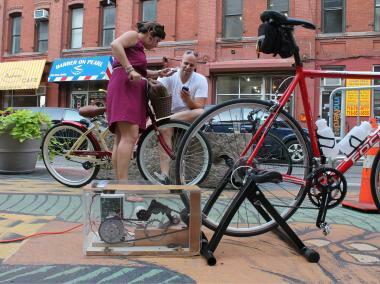 Need power.” Passersby on bikes stop to hook up to the generator and pedal for a bit. More than a dozen people stopped by to pedal on Monday, providing hours of laptop time. “It allows bikers to pedal safely in New York, get an outdoor exercise experience and generate energy,” said Grafman. The bicycle energy generator also gives neighbors the chance to have a hands-on experience in creating alternative energy, which is an important part of the project.